Until the end of the nineteenth century, lumber was the primary industry in the upper San Lorenzo Valley. Between Ben Lomond and Boulder Creek, small shingle mills and larger milling operations pockmarked both sides of the San Lorenzo River. A mile north of Ben Lomond Station, the Boulder Creek Branch crossed the San Lorenzo River onto the east bank for a short length. It was here that a shingle mill under the management of Myron Young operated from about 1896 until 1908. Young took on several partners over the years, including a Mr. Hall from 1896 to 1900, and a Mr. Lawrence from 1901 to 1908. Despite the name "shingle" mill, Young's operations north of Ben Lomond cut large and small redwood trees for processing. Much of the wood was, indeed, cut into shingles, but other split stuff such as grape stakes and railroad ties were made, and some timber was shipped off to mills to be turned into lumber, suggesting the mill had at least some railroad access, even if none was ever recorded in official documents. By early 1913, the property had sat vacant for five years and the redwoods that once sat on either side of the railroad tracks were almost entirely gone, replaced by a rolling meadow. 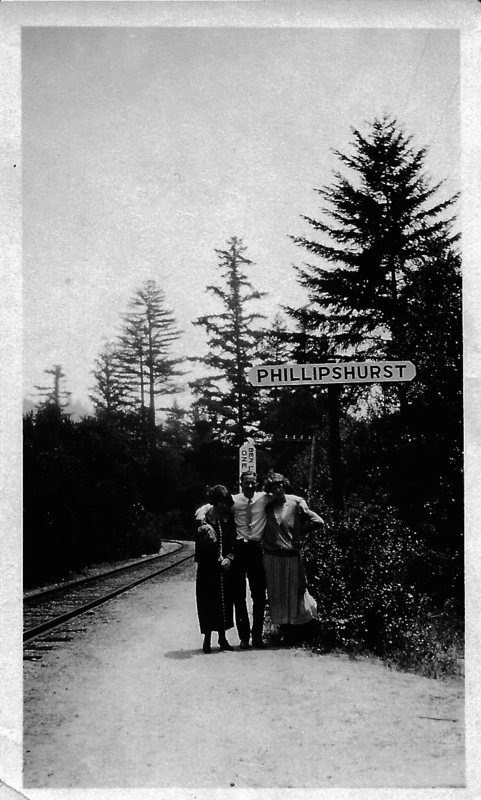 The Phillipshurst flag-stop with waiting passengers, late 1910s. Around 1901, Dr. William A. Phillips, a graduate from Western Reserve University in Cleveland, Ohio, settled in Santa Cruz County. Phillips had lived for twelve years in Reno practicing medicine and serving as the president of the Nevada State Medical Society. In 1909, Phillips became the first president of the Santa Cruz Board of Health. Around the same time, he served as the lead physician of the Woodmen of the World's Santa Cruz Branch. Little else is known about the physician except he was quite wealthy and well-respected within the county. Hoping the mountain air would help a chronic illness he had developed, Phillips purchased the 47.5-acre mill site, which spanned both sides of the river, in mid-1912 on which he built a single-story rural bungalow he named Phillipshurst. As early as March 1913, local newspapers were already gossiping about the mountain retreat. By this same time, Phillips had managed to negotiate a private flag-stop for his property. Southern Pacific was not really in the business of creating new flag-stops along the Boulder Creek Branch at this time, so it is unclear what convinced them. Money, certainly, helped but the tracks already passed through Phillips' property so there is no other clear motivation for the railroad. In any case, the stop featured a sign beside a mile-marker. Survey maps report that there was also a small shelter at the station, although why the sign was not atop it is unclear. Phillips built a short suspension bridge that spanned the river to access the stop and the lands across the river. There was no platform or additional track at the Phillipshurst stop and it was only ever listed in timetables as a flag-stop. It was the last new stop listed along the Boulder Creek Branch. Only a couple photographs of the stop exist and all depict the same outing. Phillipshurst as a station would live on until the end of the Boulder Creek Branch in 1934. However, the adjacent property have passed through several hands since 1912. Phillips sold the property in 1923 to Dr. William Everett Musgrave, who renamed it Riverwood Manor. 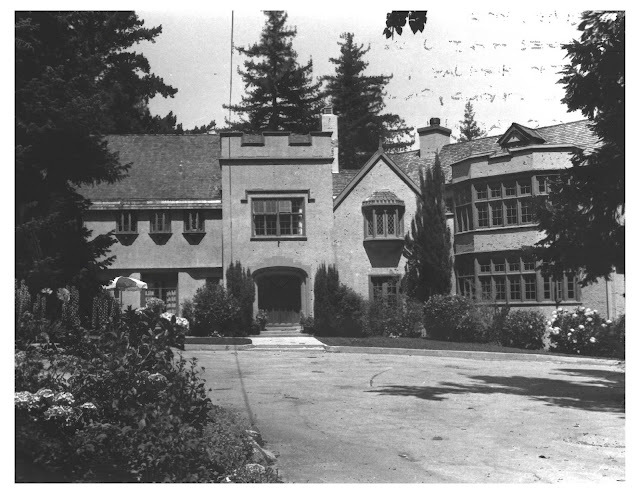 Musgrave remodelled the estate with the assistance of Albert Farr and turned it into Tudor Revival-style mansion. He also hired John McLaren, the landscaper of Golden Gate Park, to arrange the gardens on the estate. 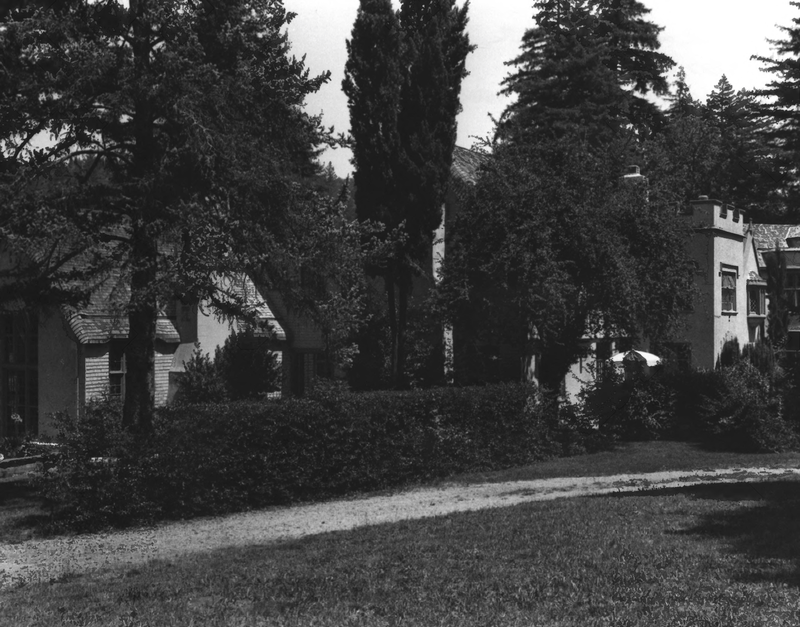 Upgrading of the estate was completed in the spring of 1925. The completed manor-house consisted of ten bedrooms, multiple kitchens, two private apartments, a music room, library, living room, and an elegantly-covered porched collectively covering 10,000 square feet of real-estate. Unfortunately, Musgrave did not get to enjoy his improved mansion for long. He died in 1927, leaving the estate to his widow, Florence Blythe Moore, who continued to reside on the property until 1936. Whether or not Musgrave and Blythe used the railroad stop during this time is unknown. Riverwood was sold to Theodore Hammond Smith who founded a school for people with mental disabilities. The estate was renamed the Blake Hammond School and the main building the Blake Hammond Manor. Blake was a reference to Smith's mother, Elizabeth Ellen Blake. Similar to the previous men who owned the property, Smith had medical training, having served as a Naval medic during World War I, and he wanted to use the mansion as a place where he could educate mentally disabled students using techniques pioneered by his mother. During his tenure on the estate, several buildings arose on either side of the river for housing, classrooms, and other amenities. Many of these structures, as well as the original Phillipshurst bridge that crossed the river, were destroyed in the 1955 flood. Smith rebuilt the bridge, which still exists today, but most of the outbuildings were abandoned. Smith closed the school in October 1968 after being diagnosed with pancreatic cancer. He died in February 1969. He and his family continued to live on the estate during this period, but the costs of maintaining it forced the Smiths to leave. After sitting several years on the market, realtors and the Smith family decided to break up the property to make it easier to sell, subdividing the forty acres on the east bank of the river while leaving the 7.5 acres on the west bank intact. 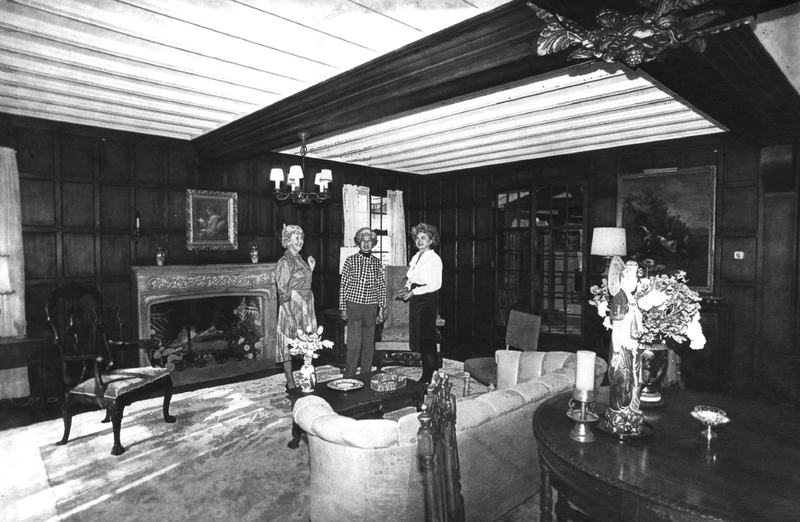 Pat Wilder giving a tour of the Riverwood Manor's living room to visitors, 1980. Photo by Pater Amos. Roger and Patricia Sambuck Wilder purchased the mansion in 1977 and immediately began the process of restoring the structure to its former glory. 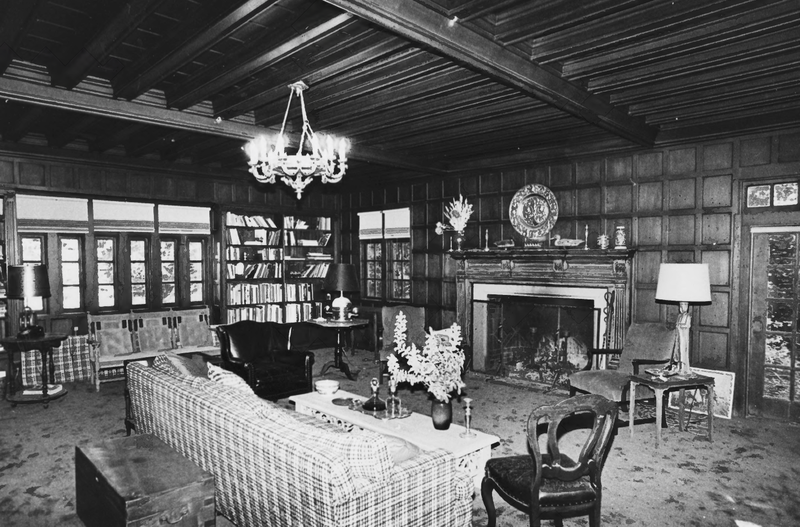 The estate was added to the National Register of Historic Places (#3004369) in August 1983. Despite plans to reopen the mansion as a medical center or rehabilitation facility, it has remained a private estate ever since the Wilders acquired the property. The site of both the Phillipshurst stop and the Blake Hammond Manor are unaccessible to the public. The stop is located near the southern end of River Road, which has since become a gated community. Nothing remains of the stop in any case, although River Road follows the railroad right-of-way in this section. The manor is still owned by the Wilder family as a private residence and tours of the structures are no longer available to the public. The manor can be partially viewed from State Route 9 just across from Pike Road—the highway wraps around a two-story structure that forms a part of the property, with the old gatehouse located directly across from this building. 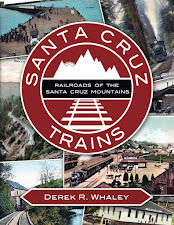 Clark, Donald Thomas, Santa Cruz County Place Names: A Geographic Dictionary. Second edition. 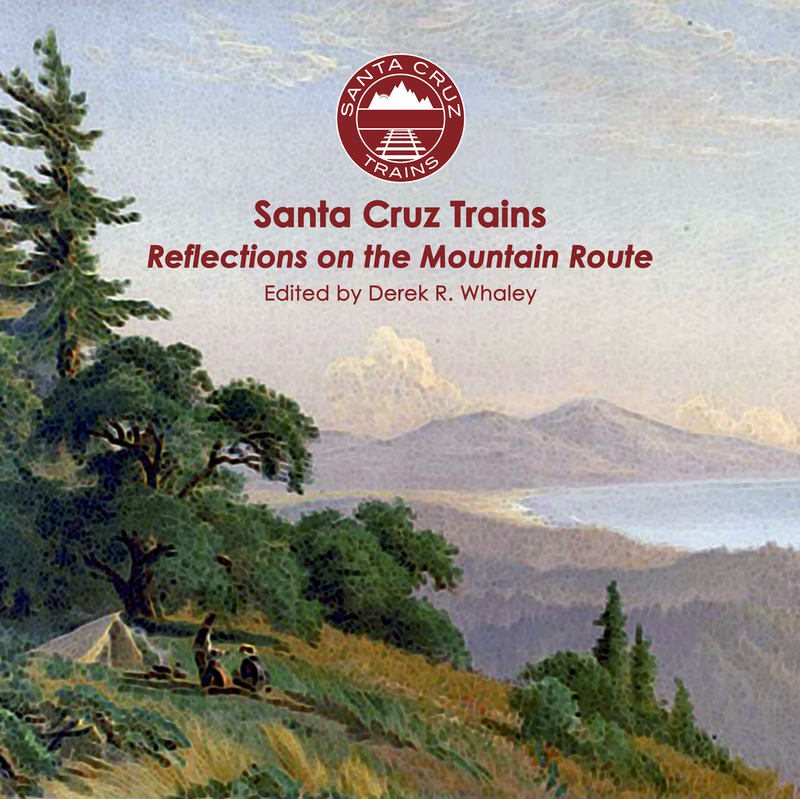 Scotts Valley, CA: Kestrel Press, 2008. Official Registry and Directory of Physicians and Surgeons in the State of California. San Francisco: Medical Society of the State of California, 1914. Santa Cruz Evening News and Santa Cruz Sentinel, 1896-1983. This is where my Uncle, George Harland Lowder, supposedly passed away from a heavy equipment accident in 1949. At the flag stop? That is very odd. I'd love to hear more information on this incident if you have anything. Around 1967-69, this area was a meadow of tall grass, similar to the Felton area. River road was a small, forgotten road with a thin coat of asphalt. The Blake Hammond School was evidently still around as a single house with restrictions housed adults during the day. Other than that, I can't remember any other item out here, but then we were pretty small and preferred the forest. The photo with the three friends looks south because of the shadows upon their faces. The trees and the curve to the track (preparation for the upcoming bridge? ), make me believe that it was further south than the meadow. Overhead wires on the west side, that sign might read "Ben Lomond, One Mile"; the style of dress and that 'modern' telephone pole suggest to me the 1920s. Necktie, and a slim one (in the photo that George Pepper contributed), tells me that this is the late teens or the twenties. I think black was popular at the turn of the century, and women wore white in the teens, so the twenties are most likely. A somewhat professional dress shirt on the man, but he lost his jacket due to the heat; my guess is that he was seeing one or both of his friends off. The photo may have been taken by another man which balances the group, so one couple saying goodbye to another. I wonder when small point-and-shoot cameras became common. The suspension bridge went down in the 1955 flood. My father, Theodore Hammond Smith built the existing bridge that connected our 40 acres on both sides of the San Lorenzo River. The bridge is no longer in use but is still behind the manor. My father bought the manor in 1936 from Dr Musgrave's estate. It became a home and school for mentally and physically challenged people. The home and school were initially in the manor and existing outbuildings until the flood of 1955, which destroyed the bridge and the surrounding outbuildings. My father had acquired 40 acres on the back side of the river and built the home\school larger to accommodate more than 100 people. He became ill in 1968 with pancreatic cancer, so the home\school was closed in October of 1968 and the occupants were moved to other institutions. My father had hoped to keep the manor and existing seven acres and do something for the valley with the back 40 acres and buildings. At the time he was mulling the idea of a Medical Center. He died February 5th 1969 and the manor and school, including bridge and barn, all had to be sold. It took 8 years to sell and sold in June of 1977. The back property was then subdivided and sold off as homes. The manor is privately owned but no longer in our family. We owned it for 41 years. Blake was my grandmother's maiden name. Hammond was the family crest name.